TET's Animator Dominator Competition has ended. It was well supported but perhaps didn't get quite as many entries as I hoped. 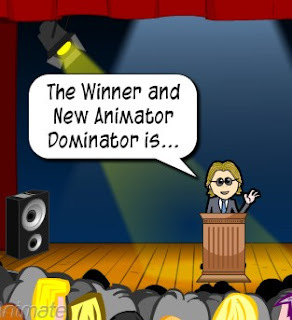 However promoting the contest was a lot of fun in the GoAnimate forum on this thread that ultimately became the inspiration for the winning entry. The forum banter that went on between various people, who are featured in the winning animation, as well as others, gives some good insight into the various characters. The same thread also inspired the story line for my official announcement animation below. So without further a do - watch the video to see who won then keep scrolling to watch the winning video. After the view collecting portion of the competition ended it looked all set for an easy win by the front runner but a decision by entrants in the voting forum to up the voting points from 20 to 50 points per vote changed things considerably. In the end it came down to one vote that could've changed the out come but the entrant with that vote never placed it (voting was optional for all entrants) despite a last minute reminder. So the winning animation was Ryco's, The Dark Lord of Death, embeded below. I think it's definitely worth mentioning and showing you the second place entry, Skitzo - Introductions, by Panda Boy, which features some really nice animation techniques, original voice work and really good timing. I'd like to finish up by Congratulating the Winner, Ryco, and thanking everyone who either entered and/or supported the contest by promoting it or watching the various entries. Whilst it was a small field of entries it did contain some big hitters and a few future big hitters to watch out for. Of all the contests I've ever been part of there's something really special about one that has no material prize yet is still well supported and just a whole lot of fun. Thank you all. I do hope you'll continue to support this competition on GoAnimate in the future. What a great contest to be a part of. It did get close there at the end, and I was beginning to think regret my decision to agree to switch the points from 20 to 50. But it all worked out to get me my second AD title! Thanks to all who participated and hopefully the next one will be lots of fun too! It's been a pleasure to enter a contest with so much fun in it. Congratulations to the previous winner for such a good organisation, and to the winner!